Bermuda will play in Group B alongside the United States, Canada and Costa Rica at the CONCACAF Women’s Under-17 Championship which kicks off in April. The team are set to make their debut at the tournament, with their fixtures scheduled for 20, 22 and 24 April. The official draw was held at CONCACAF’s headquarters in Miami today. 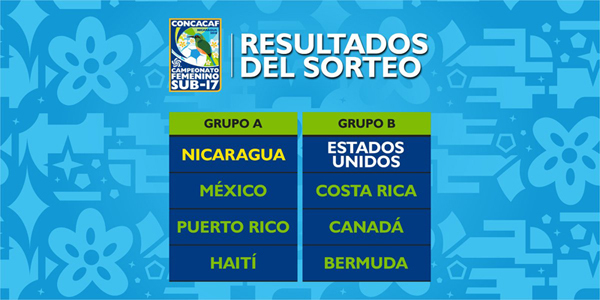 Group A, meanwhile, consists of Mexico, hosts Nicaragua, Puerto Rico and Haiti. All matches will be played at the National Football Stadium in Nicaragua’s capital, Managua. Bermuda were impressive in Caribbean qualifying, winning four of their six games – seeing off Saint Lucia, Antigua and Barbuda, Aruba and Jamaica – to reach the final, where they fell 1-4 to eventual champions Haiti. The top two from each group progress to the semi-finals, where the winners advance to the final and losers lock horns in a third-place match. The finalists and third-place match winners will qualify for the FIFA Under-17 Women’s World Cup to be staged in Uruguay from 13 November to 1 December. The CONCACAF Women’s Under-17 Championship has been running since 2008 with the United States boasting the most titles  as well as one each for Canada and Mexico. Sports journalist Nathan Carr previously ran the Home of Caribbean Football, and reports on football throughout the region, and also serves as a guest contributor to Bernews. You can read his past reports on Bermudian football here. Is their gonna be a charter flight going down.